And sure enough, as Green Mountain Daily's Sue Prent first reported over the weekend (and the Vermont Press Bureau's Peter Hirschfeld noted in Monday's paper), the conservative super PAC Vermonters First has pretty much done just that. 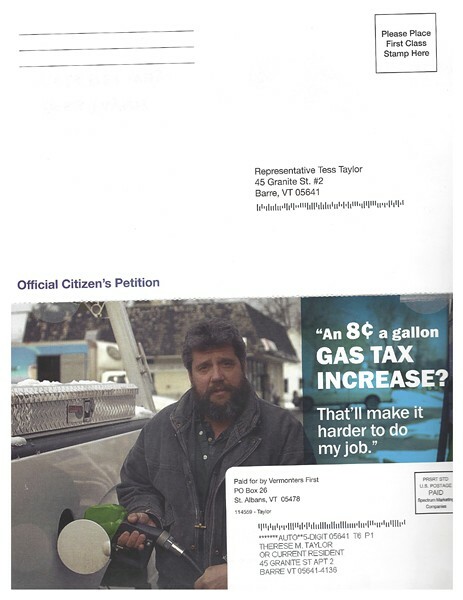 But instead of a TV ad, the organization has instead blanketed the state with direct mail pieces calling out House Dems who "just voted to go on a massive taxing spree!" Those culprits, the piece adds, are guilty of "Increasing the cost of gas, clothes, soda, and meals and raising your property taxes." 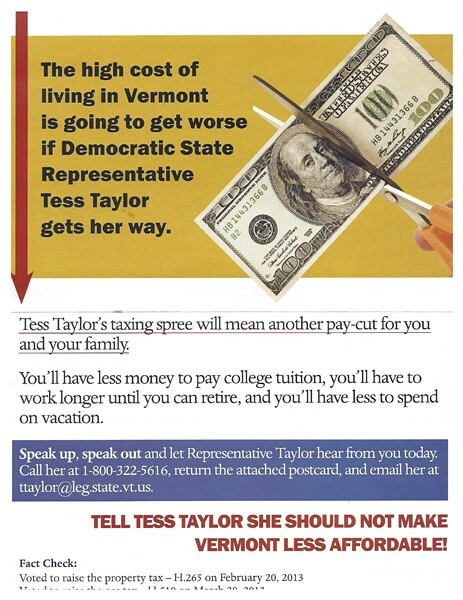 Vermonters First treasurer and consultant Tayt Brooks wouldn't say Monday how many state reps were targeted, nor how many mailers were sent. But in a written statement he said it "was delivered throughout the state" and specifically focused on House members "who voted to increase the property tax (H.265), increase the gas tax (H.510), and increase the tax on clothing, meals and income (H.528)." Vermonters First made its name during the 2012 election by spending more than a million dollars supporting Republican candidates. At the time, the group was almost entirely funded by Burlington heiress Lenore Broughton. In February, the group made its first foray into legislative lobbying by airing two TV ads hammering Democrats over several proposed tax hikes. In his statement, Brooks hinted that Vermonters First plans to make itself heard year-round. "Vermonters First is a Vermont-based organization dedicated to bringing balance to the debate over critical issues facing the state. One of the ways that Vermonters First accomplishes that goal (which, by the way, isn't only relevant around election time, but all the time) is by highlighting votes taken in the legislature," Brooks wrote. "Hopefully voters will respond by engaging their elected officials in constructive conversations about the lack of affordability in the state of Vermont." 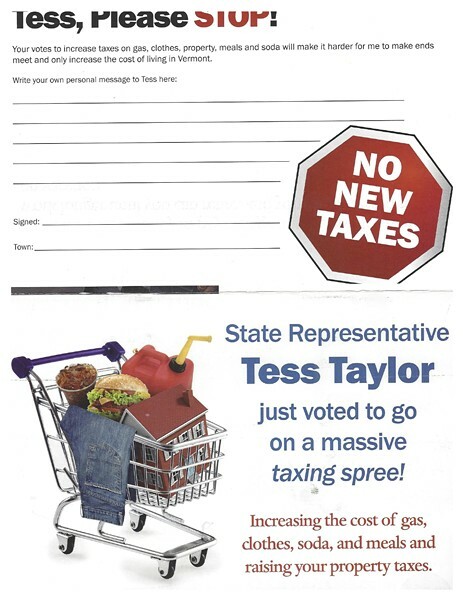 Taylor, one of the mailer's many targets, says she too wants to have a conversation with constituents who received a copy. "I'll be contacting them to have a real discussion, instead of just this attack, which doesn't really have much substance," she says. "It seems to end a conversation before starting one, and I intend to start one." What kind of messages has she received thus far from constituents who filled out the detachable postcard included in the mailer? "Some were very encouraging — telling me I'm doing a great job. Others weren't so pleasant to read," Taylor says. "I plan on contacting everyone who wrote me."